Egyptian President Abdel-Fattah El-Sisi told the UN’s special envoy to Syria Staffan de Mistura on Tuesday that Egypt will spare no efforts to halt the current Syrian crisis and suffering, El-Sisi’s spokesman said. The UN special envoy, who is visiting Cairo, and the president discussed the latest developments in Syria as well as the UN's latest efforts to reach a political settlement. They also discussed the repercussions of the deteriorating situation leading to the death of tens of thousands of Syrians, which represents a serious threat to regional and international security, presidential spokesman Bassam Rady said. The president affirmed Egypt's continued efforts to reach a comprehensive political settlement that preserves the unity of the Syrian territories, the state entity and its institutions. El-Sisi also affirmed Egypt's readiness to intensify its contacts to reach a lasting solution to the crisis in Syria, said Rady. In addition El-Sisi highlighted the importance of the will and choices of the Syrian people in shaping their future. He also stressed the need to combat terrorism. 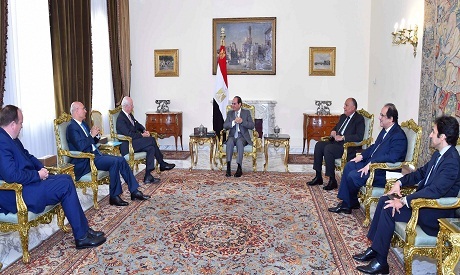 The UN special envoy hailed Egypt's role in the Middle East as one of the pillars of stability in the region, pointing out his aspiration to increase coordination and consultation with Egypt in the coming period to work to break the deadlock in the crisis.